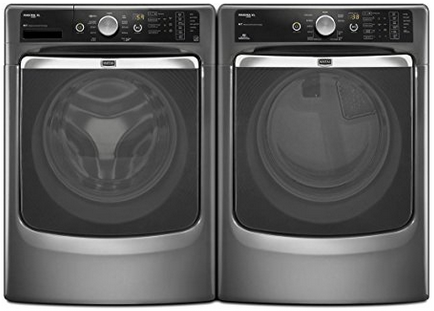 Coming in 3rd on our list, the Maytag Maxima XL 7000 series is mostly about the bells and whistles. Some of them are literal: every press of a button inspires the washer to practice its repertoire of bird calls. The dryer shuts itself off when it senses that the load is sufficiently dry. There’s a light in the wash tub, a “check lint screen” warning light, and an extra-sensitive, futuristic-looking black control panel that collects fingerprints like a compulsive crime-scene investigator. Some customers have said that all the little extra features have made laundry more fun, something like driving a car with manual transmission around the city. Others have found all the cheep-cheeps of the control panel less than appealing and were disappointed to learn that the sounds could not be turned off. Some have also noted that the text on the washer/dryer control panel is a bit on the small side. Like other Maytag models, the 7000 takes a long time to wash, even the “Normal” cycle carries on for more than an hour. And there’s no quick-cycle option, so if you’ve got a child waiting around for a soiled favorite shirt to be ready to wear again, brace yourself for a feature-length fit. There is, however, a “PowerWash” cycle that gets the job done better than most. The tub is quite deep. And there’s a fairly useful “Overnight Wash & Dry” feature. You put your clothes in before you go to bed and once they’re washed, the machine will keep them spinning and blow a fan until you get up. They aren’t going to be completely dry when they greet you in the morning, but they’ll be most of the way there, requiring just a few minutes in the dryer. A separate but similar feature is the “Fresh Hold” option, which keeps your laundry tumbling for up to 12 hours after it is washed to keep it smelling fresh if you can’t get to it right away. One reviewer called out the “Rapid Dry” and “Bedding” settings on the dryer as underperformers, while noting that the other settings were satisfactory, and the delicate cycle was top of the line, leaving the clothes absolutely dry without getting them too hot at any point in the cycle. It’s worth noting that if your laundry setup requires that you change the direction of the doors, you’ll have to order a door reversal kit. The primary drawback to this set, besides the lack of a quick-wash cycle, is the retail price. The top-dollar price tag is probably best argued for by the extra features and slick “Cosmetallic” finish, but you can do about as well for less. When it comes to performance, you can do much better for less. But, I don’t know, maybe you’ve fallen in love with the design and particular features of the Maytag Maxima XL 7000. Maybe its drawbacks are more-or-less irrelevant to your laundry habits. Maybe you’ve got money to burn and “Cosmetallic” is your favorite color. You could do a lot worse than this set.